Amanda Knox, the college junior who became the center of a murder trial that riveted the attention of millions around the world, has never told her story. Now after the dramatic Italian trial, conviction, and court appeal that finally acquitted and freed her she speaks to ABC News anchor Diane Sawyer in her first television interview. In addition, she reacts to the recent ruling by Italy's Supreme Court that has extended her marathon legal battle and put her freedom on the line again. “Murder. Mystery. Amanda Knox Speaks – A Diane Sawyer Exclusive” airs Tuesday, April 30 at 10:00 p.m., ET on the ABC Television Network. Portions of the interview will also be featured across all ABC News broadcasts and platforms including “World News with Diane Sawyer,” “Good Morning America,” and “Nightline“ as well as ABCNews.com, Yahoo!, ABC News Radio, and ABC’s local affiliates. 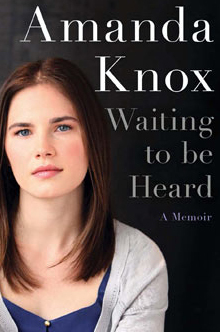 The interview airs in conjunction with the publication of Knox’s highly anticipated book “Waiting to Be Heard,” which will be published by HarperCollins on April 30, 2013.